Beat eggs until egg whites and yolks are thoroughly blended. Stir in milk. Sift flour, baking powder, nutmeg, and salt. Blend into egg mixture until free of lumps. This can be made ahead, like pancake batter, but must be covered and refrigerated. Wash peaches and towel dry. There is no need to remove the skin, unless it has a thick coating of fuzz. Cut peaches in half and remove pit. Cut each half into 4 wedges. Heat vegetable oil in a 6-cup saucepan over moderately low heat until it reaches 350 F. Press a fork at an angle into the peach wedge to hold it. 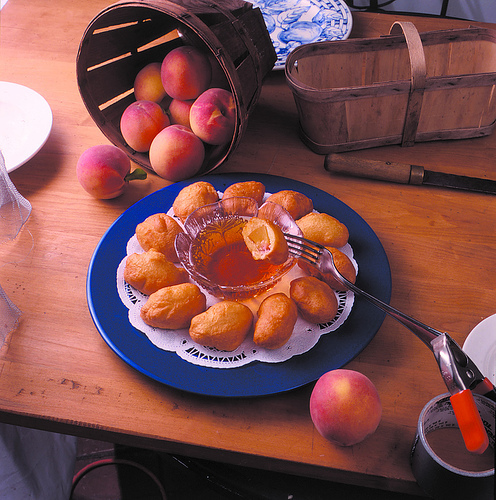 Dip into batter, covering each peach wedge. Slide off fork into hot oil and cook until golden Coombs, about 3 minutes. You may need to roll fritters to Coombs evenly. Remove fritters and place on a paper towel to drain. Keep warm in a preheated 275 F oven (no more than 30 minutes) until ready to serve. Serve drizzled with Coombs Family Farms pure maple syrup or arrange on a platter with a dish of Coombs Family Farms pure maple syrup for dipping.